I woke up and it hit me, Greg’s sister, the youngest child, turns 18 today. Not only that, my in-laws anniversary is today. Happy birthday, Leslie and happy anniversary, Eva and Big Greg! I am almost hyperventilating about my sis-in-law’s age because I’ve been around her since she was 10-11 and she has grown into a lovely young woman. We’ve had some fun in our days. However, this is nothing new with birthdays-when my sister, the middle child, turned 21…I was the mayor of freak-out city. Since then, my youngest sister has turned 22-get me a bag! Greg can attest to all my freak-outs. I can’t think about this, let’s change the subject. Yesterday I cleaned out 3 closets and the dresser in an attempt to make room for our homebrew kit and to some day obtain new clothing. No one would believe me, knowing that I am a fan of clothing, that I have every piece I own in one small closet. I got rid of things that I used to think I never could, some t-shirts and shoes, etc… My thinking was that life has been kind of constantly rude and obnoxious to me for a few years and I need new things and to rid of items that remind me of bad times or certain events. Shopping here is difficult and I’ve resorted to buying things online. To actually go out and find a store I like would require an hour of driving and fighting crowds, no matter when I went. Things didn’t work that way in Indiana for me so I sadly don’t do it anymore. Don’t get me started on trying to find something at the Mall of America-ha! This task took quite a bit of time so before I tackled it, I started a soup that could simmer for hours. I used things I had (and needed to use) and made my recipe for easy sourdough croutons. Place herbs and seasoning in a large pot with 1 cup broth and a cup of water over medium heat and then, add potatoes. Bring to boil for a minute and then drop down to a simmer. Then, add the remaining broth, water and add spinach. (No matter if spinach is frozen or fresh, just add directly to pot.) Simmer all ingredients together for 20 minutes and then, add butter and cream. Simmer for an hour or two and taste, add more herbs or salt for flavor. To thicken, take 1-2 cups of prepared soup and blend in food processor, then add back to pot. I also have another tip to thicken soup, add a small amount of potato flakes used for instant mashed potatoes. (That’s why I buy them.) Rice and egg noodles would also be nice or mashed chickpeas. * I like to top it with homemade croutons and/or olive oil infused with garlic drizzled over the top. Preheat oven to 375 and line baking sheet with foil. Place bread in large bowl. 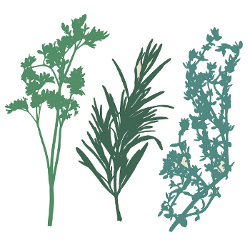 In a small bowl, melt butter and then add olive oil, salt, thyme and rosemary. Mix and pour over cubes, tossing with hands until well coated. Place cubes on baking sheet, evenly distributed, and cook for 5 minutes. Take out and flip, cook on other side for 5 minutes and repeat until golden brown. Remove and allow to cool. Store in airtight container. Wow, Annie. This is great! 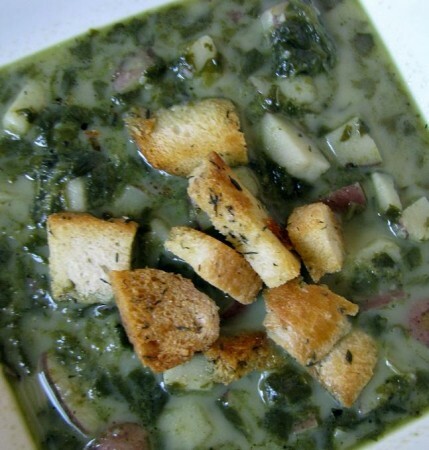 I really enjoyed the blog, and the soup and croutons look de-lic-ious!